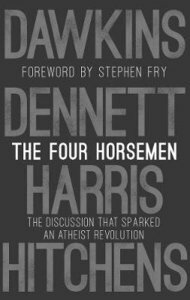 About "The Four Horsemen: The Discussion That Sparked An Atheist Revolution"
Richard Dawkins writes about such topics as DNA and genetic engineering, virtual reality, astronomy, and evolution. Dawkins was educated at Oxford University and taught zoology at the University of California and Oxford University, holding the position of the Charles Simonyi Professor of the Public Understanding of Science. He is a member of the International Academy of Humanism. Dawkins's books include The Selfish Gene, The Extended Phenotype, The Blind Watchmaker, River Out of Eden, and Climbing Mount Improbable. Christopher Eric Hitchens (born April 13, 1949) is an English-American author, journalist, literary critic, and apologist for atheism. He has been a columnist at Vanity Fair, The Atlantic, World Affairs, The Nation, Slate, Free Inquiry, and a variety of other media outlets. He currently lives in Washington, D.C.
Hitchens is a political observer, polemicist and self styled political radicalist whose books - the latest being God Is Not Great - have made him a staple of talk shows and lecture circuits. In 2009 Hitchens was listed by Forbes magazine as one of the "25 most influential liberals in U.S. media." The same article noted, though, that he would "likely be aghast to find himself on this list". Born in Boston in 1942, Daniel Clement Dennett explores the philosophical links between mind and brain. His first book, Content and Consciousness (1969) was one of the earliest to examine this issue. It is one that he expands on in his other books, including Consciousness Explained (1991), where he uses philosophical "materialism" to examine the link between mind and body. Dennett is a Distinguished Arts and Sciences Professor, a Professor of Philosophy and director of the Center for Cognitive Studies at Tufts University in Medford Mass. He is interested in the development of artificial intelligence, was the co-founder of the Curricular Software Studio at Tufts, and has aided in the design of computer exhibits at the Smithsonian Institution, the Museum of Science in Boston and the Computer Museum in Boston.